Sold with one sheet of concept art and a title, KILLER KLOWNS FROM OUTER SPACE was never destined to be aligned with the slasher films of its era. Instead, it was a strange hybrid of science-fiction, horror, and comedy that was very much of its time but singular in its execution. Armed with popcorn guns, cotton candy cocoons, and... shadow puppets the clowns in this film are deadly alien invaders hell-bent on terrorizing a small college town. Mike and Debbie caution the neighborhood police that something strange is happening in their modest municipality. Specifically, a spaceship that looks like a giant circus tent has touched down and alien clowns are kidnapping the townsfolk. The cops are understandably doubtful. But after a short period of time, reports come rolling in from multiple citizens with similar stories, they have all experienced run-ins with the large shoed attackers. 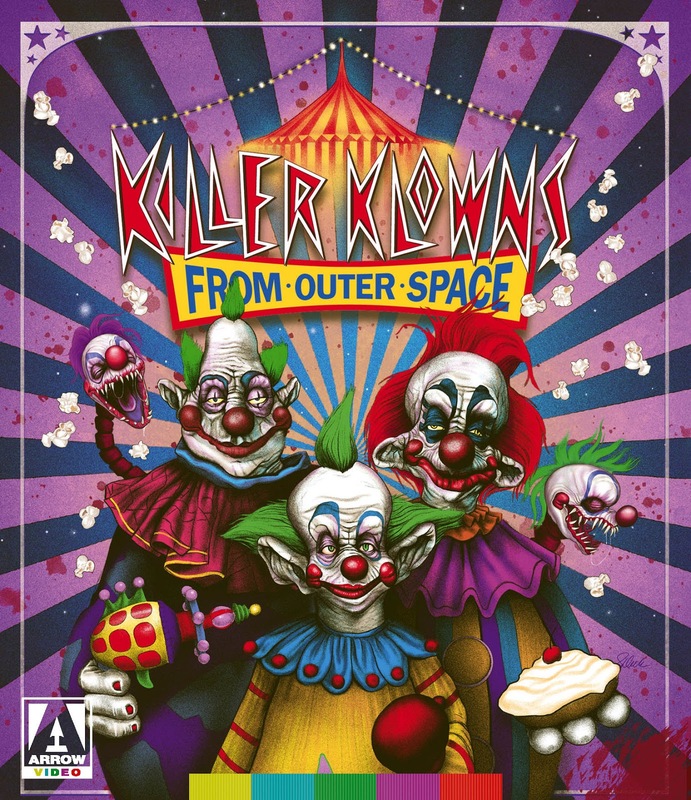 Paying homage to THE BLOB, INVASION OF THE BODY SNATCHERS, and NOT OF THIS EARTH, KILLER KLOWNS FROM OUTER SPACE takes a premise (that would have felt right at home in any 1950's drive-in theatre) and lands it squarely in the 1980's. Stripping away all the subtext and nuance that made those films classics and replacing it with deadly balloon animals. KILLER KLOWNS is in no way concerned with the politics of its era and has little to say beyond its surface. In that way, it makes a perfect time capsule for the mid to late 1980's. A vapid, self-absorbed, cocaine-snorting, jazzercising period when Bill Cosby was a righteous role model for yuppies and suburbanites alike. The restoration for this release is superb. The 4K transfer from the original negative allows the film to look better than it ever has before. I hadn't seen the film in the better part of 20 years and was stunned by how good it looks. The matte paintings in the film are simply gorgeous. Granted this is low budget schlocky filmmaking but there are true moments of visual artistry on display that I had previously ignored. Part of that could be my predilection for tactile effects, but this film is quite fetching to this viewer. A must own for any genre fan. To purchase your copy of KILLER KLOWNS FROM OUTER SPACE from MVD entertainment group click HERE.